With the San Antonio Spurs defeating the Memphis Grizzlies in only six games, Spurs fans had high hopes for facing the Houston Rockets, the only other Texas NBA team in the playoffs. However, the game didn’t go quite as expected. On Monday, May 1st, these two teams met on the Spurs’ court, a usual advantage for the Spurs. Fans flooded the stands with every expectation to go home feeling happy. Children and adults alike watched in awe as the players they admired practiced only feet away from them. The fans were hopeful after the crushing defeat against the Grizzlies. The players were ecstatic after their win. Everything was lined up for a perfect game: supportive fans and phenomenal players. As the game began, the fans began to grow restless. 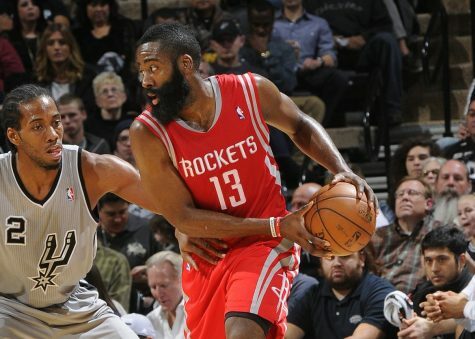 The Rockets were firing off countless three-pointers, and the Spurs could hardly keep up. The young Spurs’ star, Kawhi Leonard, could hardly defend the frontman of the Rockets, James Harden. By the end of the first quarter, the Rockets were already up by eleven points. After a short break between quarters, fans were hoping that Coach Popovich could fire the Spurs up enough to make a comeback. Instead, the Rockets’ lead increased, becoming even more embarrassing for the Spurs. By the end of the game, the Spurs were trailing with 99 points compared to the Rockets’ 126. To say the game was disappointing would be a huge understatement. The fans left the game with their tails between their legs and a lack of hope for the games to come. The next game, still in San Antonio, will be May 3rd. Will the Spurs be able to overcome the crushing loss, or will they remain a pawn in the Rockets’ game? What's your goal for the new year? Is The Kaep Time over?